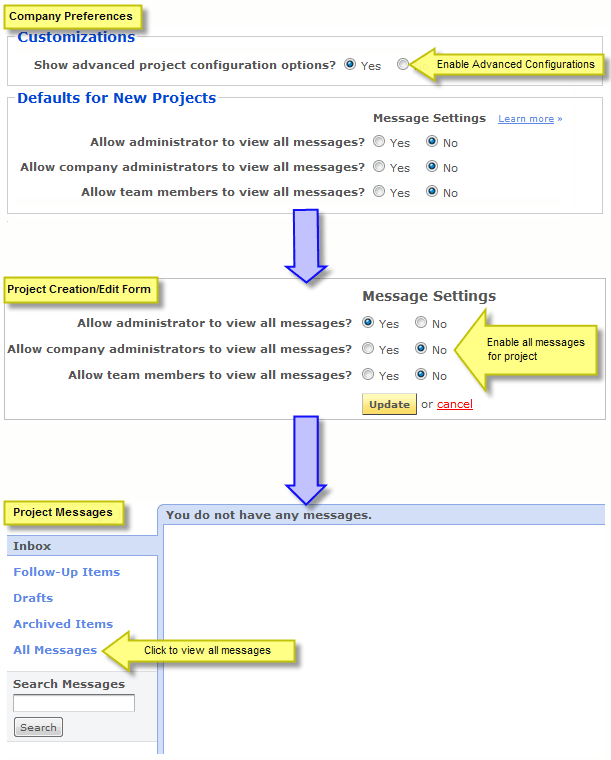 Normally, project members can only see messages that have been sent specifically to them or to the entire project team. It is possible, however, to configure a project so that specific users (such as the project administrator, company administrators, or any project member) can view all project messages. Allowing other project members to view messages that have not been sent specifically to them can be useful in certain situations. For example, if you are managing a lot of projects but are not involved in them on a daily basis, it can be useful to be able to view the messages that have been sent for a project because it allows you to get caught up on the relevant discussions or issues that have occurred in the project. You could achieve a similar effect previously by sending all messages to everyone in the project, but this had the drawback of everyone being notified about every new message even if it's not relevant to them. The new settings allow you to send messages only to the relevant project members but still allows you to review all previously sent project messages. If a user is allowed to view all messages for a project, they will see a "All messages" folder in the messages section of the project. Clicking on the folder will allow the user to view all previously sent messages for that project. The message inbox for a project will state if messages sent for the project are not completely private and it will note which users are able to view all messages. For security reasons, users will not be able to view messages that were sent before enabling access to all messages. Also, if you disable access to all messages for a project and then reenable it again in the future, only messages sent after enabling access to all messages again will be viewable. 1. Define your company if you haven't already done so (click on the "Company" link under the "Admin" menu). 2. Click on the "Preferences" link from the company management page. 3. Select yes for "Show advanced project configuration options?" and then click "Update". You will now see the "Message Settings" options when editing or creating a new project. 4. Edit the projects that you want to configure the messages settings for.